Photo: London Permaculture. Creative Commons BY-NC-SA. Nader Khalili was an architect, teacher and inventor of a unique construction method. Khalili’s innovative method was inspired by Rumi — the 13th century mystic poet — and the ancient Middle Eastern architecture he encountered on a five-year motorcycle ride across his homeland in the Islamic Republic of Iran. Combining Rumi’s philosophy on nature with ancient building methods and modern technology and know-how, Khalili (1936-2008) developed his novel ideas into construction techniques. 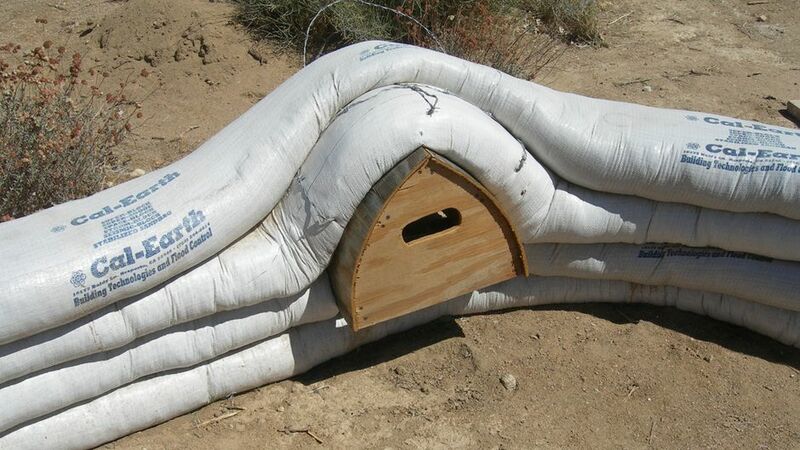 Based on ancient but simple human shelters, the SuperAdobe system — also called the super block method — uses layers of sand-filled bags that are coiled and placed one upon the other. The bags are securely attached into a dome-shaped structure using barbed wire. For extra stability, the buildings or adobe (a structure made of sun-dried clay or soil bricks) is held together using cement, lime, or asphalt emulsion. The adobe structure is simple in appearance but strong and resistant to floods, fires, hurricanes and earthquakes. It provides insulation against both heat and cold, and can be quickly constructed by men, women and young adults. Because his invention is easy to use, ecologically friendly and inexpensive, the new buildings are preserving the environment and radically improving the quality of life of countless people around the world. In order to convert his idea into a viable project, Khalili had notable research and development (R&D) partners, such as the National Aeronautic and Space Agency (NASA), the Los Alamos National Laboratory, and the Space Studies Institute at Princeton University. Working with McDonnell Douglas Space Systems labs, the architect explored ways in which the sun could be harnessed to melt and fuse luna soil into shapes and forms with building applications. In 1986, Khalili continued his R&D by founding the Geltaftan Foundation (“gel”, means “clay”, and “taftan”, means “firing, baking, and weaving clay” in the Persian language) which aimed to create earth-based ceramic houses. A few years later, the entrepreneur incorporated the foundation into a new non-profit and charitable organization — The California Institute of Earth Art and Architecture (Cal-Earth). 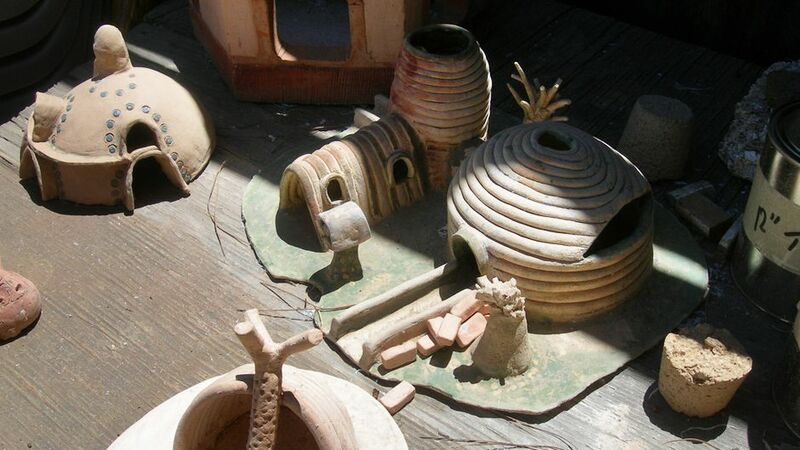 Although Khalili’s original focus was on fired, ceramic buildings, at Cal-Earth this shifted to sand-bag based buildings that would culminate in the development of SuperAdobe, a building technology based on Rumi’s philosophy (i.e., “Yekta-i-Arkan” – unity of elements). Cal-Earth is guided by three principles: (1) shelter is a basic human right; (2) every human being should be able to build a house for him or herself; and, (3) the best way to provide shelter for increasing human populations is by building with earth. Prototypes of SuperAdobe were built and have been tested successfully for the city of Hesperia in California and passed industry building standards for California, a region renowned for earthquakes. A typical SuperAdobe building has an 8 to 10 foot interior diameter dome with about 120 square feet or less in floor area. The technology is resistant to earthquakes, fire, flood, and hurricanes. It has a thermal mass (where heat is absorbed in hot environments or given off in cold ones) that creates comfortable living spaces based on the long-standing, sustainable architectural methods of harsh climatic environments such as those in Iran. Because SuperAdobe structures are easy to build, secure and both cool and warm, the buildings are used in developing countries and for emergency shelter, especially for people displaced by conflict or natural disasters. Cal-Earth members work under the philosophy that ecologically sustainable, economically viable, and durable buildings are not just possible but are also desirable. To this end, the organization provides educational materials (DVDs and books) in environmental arts and architecture and instructs learners via building workshops and seminars in the US and abroad. A typical workshop shows participants how to construct with building materials that are light yet flexible and can be created on site. SuperAdobe structures use traditional arches, domes, and vaults, earth or sandbags and barbed wire intertwined by single and double curvature compression shell structures, in order to reach the ultimate in strength. Photo:London Permaculture. The sand-bags, for instance, can be filled using small pots such as coffee cans or other kitchen utensils. SuperAdobe structures use traditional arches, domes, and vaults, earth or sandbags and barbed wire (four-point, two strands, galvanized wire which is recyclable) intertwined by single and double curvature compression shell structures, in order to reach the ultimate in strength. Alternatively, modern building techniques such as base-isolation (where the foundation is separated from the super structure) or aerodynamics are used to cope with environmental challenges such as earthquakes or strong hurricanes. SuperAdobe structures therefore apply tree-free approaches to construction. 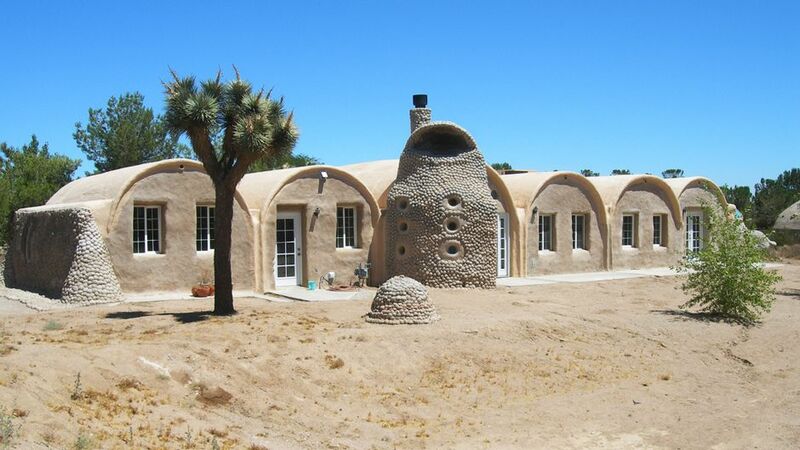 Instead of felling trees to build houses, adobe buildings use mud and soil instead. The same method can build silos, clinics, schools, landscaping elements, or infrastructure like dams, cisterns, roads, bridges, and can be used for stabilizing shorelines and watercourses. SuperAdobes, moreover, are a valuable addition to efforts intended to reduce the risk to public health caused by poor housing in disaster prone areas. Indeed, in 2011 the United Nations International Strategy for Disaster Reduction (UNISDR) report – the Global Risk Assessment Report on Disaster Risk Reduction (GAR) – highlighted the risk faced by nations across the world due to catastrophic events such as cyclones and earthquakes. Having identified countries with a low gross domestic product as being most at risk from such disasters, the GAR made several risk reduction recommendations with reference to the most vulnerable countries including the Republic of Haiti, the Islamic Republic of Pakistan and the Socialist Republic of Viet Nam. Because SuperAdobe structures have been successfully tested against natural disasters, are easy to construct, and are cost-effective, Cal-Earth believes that this technology has the potential to greatly reduce risk — due to natural disasters — and thereby safeguard the health of millions of people across the world who are living in low grade accommodation. Cal-Earth also seeks to minimize the environmental impact of the materials used to construct its homes. The organization uses both bio-degradable bags and low Ultra-Violet (UV) bags that do not omit toxic chemicals (unlike natural woven jute bags) to construct its homes. While permanent SuperAdobe buildings are reinforced with plaster to prevent erosion, temporary structures are designed so that they can erode and – in time – return to the earth. Recognizing the potential for his invention to help poor and vulnerable people around the world, Khalili sought to protect it against commercial exploitation for purposes that may deny access to those who need it most. “The mission of my life for the last 25 years has been to provide shelter for people who cannot afford it. But you need to protect this, because many systems of building have been started for the poor, but along the way they become too commercial (for) them,” he said. Because Khalili wanted his invention offered freely to the poor but available to be commercially licensed, the inventor established a comprehensive intellectual property strategy and retains all copyrights for its building designs and drawings. The mission of my life for the last 25 years has been to provide shelter for people who cannot afford it,” says Nader Khalili. This has allowed Cal-Earth to explore new commercialization and expansion opportunities around the world including Jordan, Australia and Mexico. Apart from the basic structure of the SuperAdobe itself, Cal-Earth has created two new brands of adobe construction. Eco Dome or “moon cocoon” (and the Double Eco Dome) is a small home design consisting of a central dome surrounded by four smaller niches in a clover-leaf pattern. Eco Dome building packs are available to order online for do-it-yourself builders. Earth One Home, on the other hand, is based on a pattern of three offset vaults which allow a maximum view through the house’s open-plan area. Eco Dome building packs and instructions, retail at US $2,400 for a single unit (400 sq. ft. approx), and US $3,200 for double unit (800 sq. ft. approx.) and are available to buy on the Internet. Mr. Khalili’s vision of decent, affordable and inexpensive housing for all has captured the imagination of people around the globe. In recognition of his contributions to technology and society the visionary inventor has received several awards and citations including the “Excellence in Technology” award from the California Council of the American Institute of Architects; the UN, and the US Department for Housing and Urban Development award for “Shelter for the Homeless”; and citations from NASA, the Aga Khan Development Network, and the American Society of Civil Engineers. Cal-Earth reached its 25th Anniversary in 2011 and the organization is carrying on its founder’s vision by giving monthly workshops on the SuperAdobe technology and construction methods around the world. This article appears with permission of the World Intellectual Property Organization and Cal-Earth. World Intellectual Property Organization and Cal-Earth. All rights reserved. John Amari is a freelance writer and researcher from the UK who has written articles on intellectual property and business related matters for the World Intellectual Property Organization’s (WIPO) IP Advantage website.